Master Mechanic Wins CARS Magazine Technician of the Year Award! Master Mechanic Wins Technician of the Year Award! 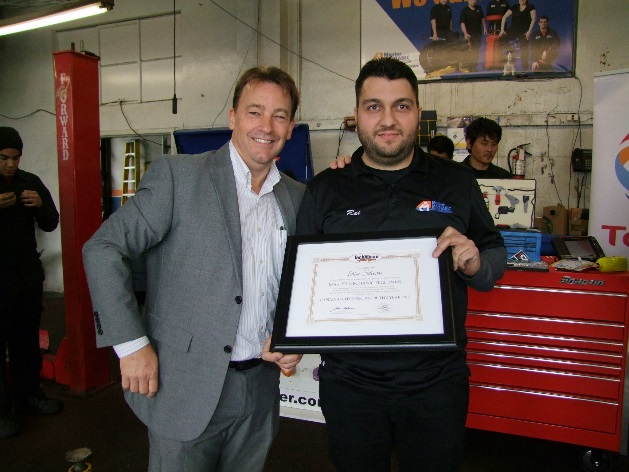 We’re thrilled to announce that Master Mechanic High Park’s very own Rui Silvestre has won the coveted Technician of the Year Award from Canadian Auto Repair and Service Magazine (CARS)! To make their decision, a panel of judges carefully considered 44 nominations to select their shortlist of only ten finalists. Those finalists were assessed by a group of 11 shop owners, trainers, and technicians to decide on the winner: our very own Rui Silvestre! Rui’s constant commitment to his trade is an exemplary model for all technicians, and the care he takes with his clientele is remarkable. Those that have had the pleasure of meeting him know that he is one of the most honest and knowledgeable mechanics around—and friendly to boot! Whether it’s a one-on-one care clinic, or not, gaining customer trust is paramount to him, and he often shows his clients the worn parts before he replaces them. If the customer is not in the shop, he’s even been known to snap a photo and send it over to maintain full transparency! When’s the last time you heard of a mechanic doing that!? Rui’s outstanding reputation extends beyond his relationship with clients. Among his staff, he is a beloved mentor and true “Master Mechanic.” He can fix the unfixable, often repairing cars that were turned away by other shops. A huge advocate of ongoing training, he’s always keeping up with the latest technology, trends and practices to serve his clients best. He works closely with his younger colleagues, coaching them on best practices, while ensuring they’re confident and comfortable with everything they’re working on—even if it’s on his own time, after hours! Rui has the utmost respect for his trade and invests time fostering future generations of mechanics. He has hosted multiple sessions with grade school students to provide hands-on education with real vehicles. At the end of the day, he sent each child home with a tire pressure gauge, LED flashlight, a SNAP-ON screwdriver–and a smile. Rui’s service to the community doesn’t stop with cars. Community involvement is core to Master Mechanic High Park, and Rui is leading the charge! In partnership with Owner, Josie Candito and Mike Tavares, he’s helped orchestrate fundraising initiatives for women’s shelters, dog shelters, local food banks, and many other charitable organizations. Together, they created the immensely popular winter campaign that saw scarves stationed outside their store for anyone that needed one. Not only did local neighbours get involved, but Master Mechanic Head Office also purchased scarves to further support the initiative at each one of their locations! It’s a gesture Master Mechanic High Park is repeating this holiday season. You might be a fan of Rui’s work and not even know it. Day-to-day, Rui is involved with the community message board in front of the shop, which displays inspirational and motivational quotes for all to see. It’s had such an impact on the community that it was featured on blogTO and in a few local publications! For his accomplishment, Rui received a custom-designed toolbox from SNAP-ON Tools of Canada, a complimentary registration to Lindertech North, and prizes from Total Canada Lubricants, all of whom sponsored the award. 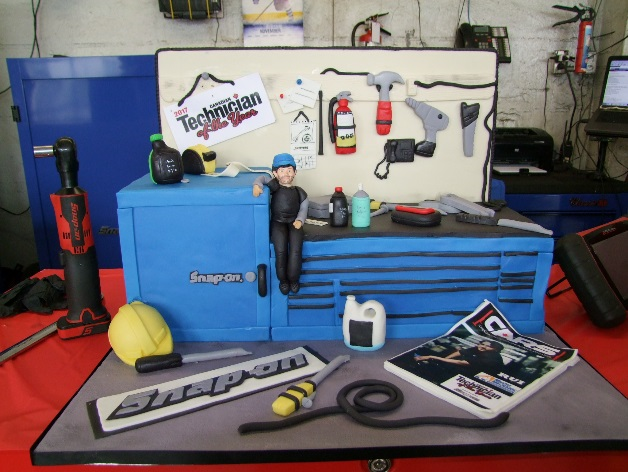 Perhaps the coolest thing of all, though, was a custom-made mechanic cake served after the ceremony! There to present his award were, Master Mechanic Inc. owners Hugh Welsford and Jamie Holmes, SNAP-ON Tools President Ray Lavender, CARS Magazine editor Allan Janssen, Total Canada Lubricants representatives, and the Master Mechanic High Park team. As you can probably tell, we can’t say enough about Rui! Luckily, his reputation with his customers and the community speak for itself—and so does his work. Although we know he does it for his love of the job and his clients, we’re so proud that he is being recognized for his efforts. You may read the full article here. 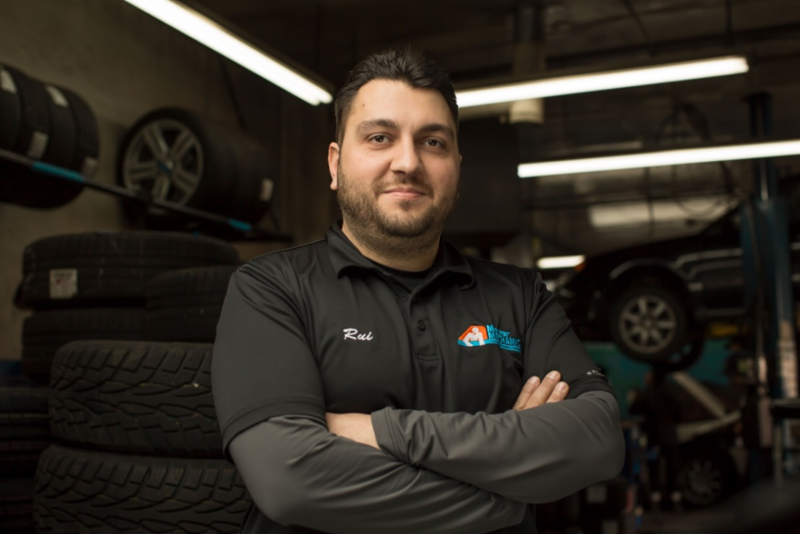 To book an appointment with Rui or any of the highly trained staff at Master Mechanic High Park, give us a call at 416-532-2449 or pop by the shop. We’re always happy to help!